Regional round table “Challenges in implementation of Chapter 27 at the local level”, was held on 19 May 2015 in Berane, organized by the Municipality of Berane. 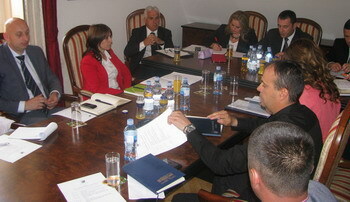 The roundtable was opened by Mr. Dragoslav Scekic, Mayor of the Municipality of Berane. Besides representatives of the host municipality, the round table was atetended by Ms. Daliborka Pejovic, State Secretary in the Ministry of Sustainable Development and Tourism and member of the Negotiating Group of Montenegro; Mr.Refik Bojadzic, Secretary General of the Union of Municipalities of Montenegro with associates; Ms.Anela Cekic, Mayor of the Municipality of Gusinje; Ms.Ana Stanisic Vrbica, from the Delegation of the European Union to Montenegro; Ms.Gordana Djukanovic, from the Environmental Agency; as well as vice presidents, managers and secretaries from the municipalities on the north-east of Montenegro: Bijelo Polje, Petnjica, Plav and Rozaje. At the very beginning, Mr.Dragoslav Scekic welcomed the attendees and thanked for presence, which indicates the importance of this issue not only for the state but also for local government units and, consequently, for the citizens’ life quality. By organizing round table, the Municipality of Berane intended to give its contribution to the European integration of Montenegro, towards the opening of Chapter 27, which relates to the environment and climate change, expecting late this year or early next year. Ms.Daliborka Pejovic presented the obligations arising from the Chapter 27, one of the most difficult chapters in the accession negotiations. She pointed out that the transposition of the acquis, ensuring its full implementation and the use of pre-accession funds in the process an important task, which placed great challenge before Montenegro. To respond to this challenge, the government administration and the local government units must restructure and strengthen its administrative capacities and to clearly define the roles and responsibilities of each individual in this process. In this regard, local authorities will have the full support of the state administration. In his introductory remarks, Mr.Refik Bojadzic referred to the numerous challenges that facing local government units in order to ensure the implementation of obligations under Chapter 27, bearing in mind that a significant part of local governments’ own affairs are relating to the environment. He stressed the need to strengthen the administrative capacities of local governments for preparation and implemention of projects funded by the European Union, the creation of financial preconditions for strengthening the absorption capacities of municipalities, as well as the necessity of inter-municipal cooperation, and in this, in terms of financial and implementation very challenging and complicated affairs. He also spoke about the ongoing activities and activities that has been undertaken by the Union of Municipalities in the previous period in this filed. In this sense, he particularly emphasized the importance of the functioning of the Network of Municipal Project Managers. He also informed the attendees on the Union of Municipalities’ initiative to establish an appropriate mechanism which will enable local government units to provide pre-financing and co-financing of EU projects and, thus, more efficient use of available EU funds. He appealed to the Ministry of Sustainable Development and Tourism to support the Union of Municipalities in the implementation of initiatives that would significantly improve absorption capacities and implementation of IPA projects. The presentation of environmental capacities of Municipality of Berane, presented by Ms.Rita Barjaktarovic, head of the Department of Environment and Tourism, was followed by a discussion on the topics of waste management, water management, assessment of environmental impact, strategic assessment of environmental impact, environmental protection and noise and administrative capacities of local government units.